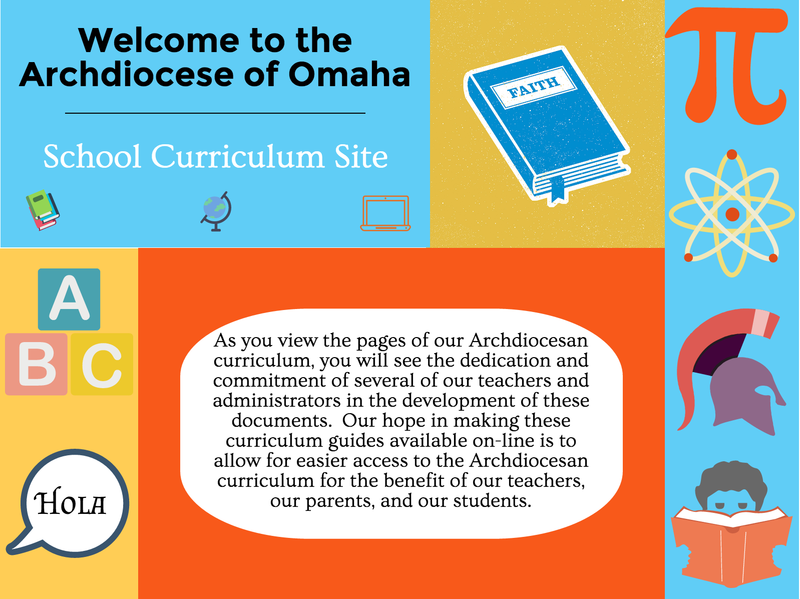 The purpose of this standards-based curriculum is to assist administrators and teachers of the Archdiocese of Omaha in teaching subject area content in the Archdiocesan Catholic schools. This site contains links to each subject areas with clear expectations and education standards as well as specific Nebraska Standards relating to each program standard. It is intended that this material be used in the development of local subject area education curriculum plans and for the training of teachers. Administrators will use this curriculum to assist teachers in applying the desired subject area education standards to the specific grade levels. Teachers will use this curriculum as the basis for planning their lessons for the year. Use of the curriculum will assist students in attaining the standards for which all are accountable. Teachers are required to spend 80% of their time teaching strictly from the curriculum guide with the remaining 20% of their time teaching concepts that enhance the curriculum.